In this joint GA, the gathering started with the same fellowship activity about honoring brothers and sisters. This is followed by the first session entitled, “The Splendor of our faith” given by Maricor Soriano with Siegrid Tejeno as sharer. This session was about the history and foundation of the Catholicism. The second session entitled, “Life of Virtue” was given by Rose Padilla and Cindy Creer as sharer. This session discussed the importance and application of the cardinal and theological virtues of Christian life. The last session entitled, “Taking a Stand” was given by Rowena Elemento and Inah Bancoro as sharer and talked about the mission of every Catholic and SFC to continue to be a living witness of Christ in order to build a Christ-centered society. Lastly, Bro. Jason and Sis. Rubina Domingo were announced as the new SFC couple coordinator of Central Bangkok and the couple coordinator of North Bangkok Bro. Louie and Sis. Pinky Lepiten together with the Family Ministry head Bro. Sonny and Sis. Marites Montalbo. 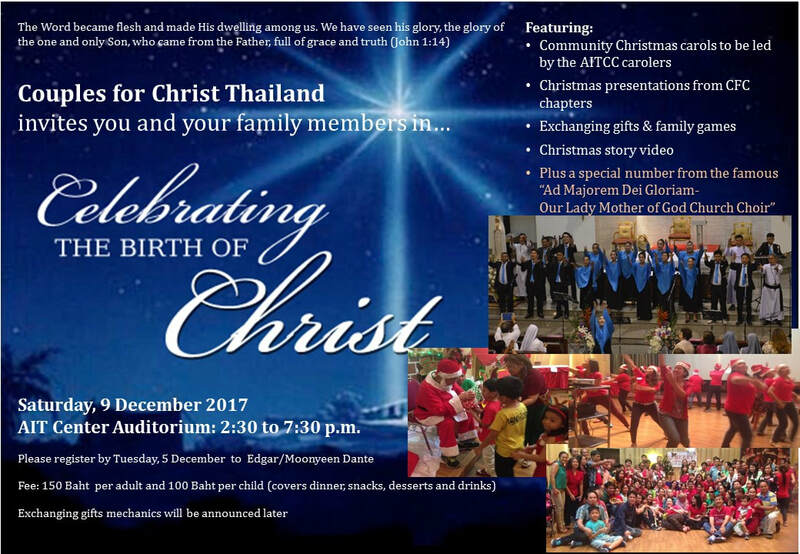 Over 250 members of CFC Bangkok community gathered at the AIT Centre Auditorium to celebrate the birth of Jesus on 9 December 2017. The celebration activities were centered around the theme taken from John 1:14 "The Word became flesh and made His dwelling among us. We have seen his glory, the glory of the one and only Son, who came from the Father, full of grace and truth". On behalf of the Council. Sim Caluyong gave the opening prayer and welcome remarks. This was followed by an inspiration Christmas video to set the tone of the celebration and presentations from the various chapters and ministries. Also featured in the event was a special event from the "Ad Majorem Dei Gloriam - Our Lady Mother of God Church choir led by Pats and Carla Gonzales. The family ministries organized group dynamic and games to add further excitement and the chapter from South and West Bangkok facilitated a Christmas sharing of gifts. 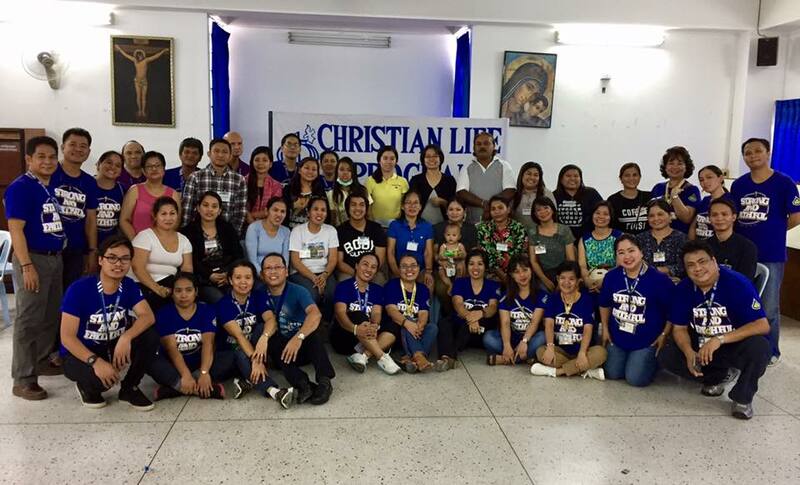 On 18 November 2017, members of the CFC Singles for Christ together with the team of Fr. Prasit organized a medical mission at Ratchburi, Christmas gift-giving (sweater, toiletries, milk, chocolate, juices, ice cream, cookies, etc.) and games for fun. More than 100 children together with their parents received gifts and medical attention. People from Ratchaburi became a family of SFCs and expressed gratefulness and happiness whenever the group visit them. This activity is being organized on a quarterly basis. SFCs are inviting any member to join and experience this service by contacting Aliw and Rowena. Jun and Jean Uriarte met with members of CFC Bangkok at the Holy Redeemer Church on Sunday, 5 November 2017 and gave a teaching on Raising a Holy Family. They emphasized the core mission of Couples for Christ to be true images of Christ in the world, servant to one another, servant to their children and servant to others. They shared the example of the New testament couple characters Aquila and Priscilla as a model CFC serving God as a pastoral team. They pointed to the CFC Family Ministries, especially the Kids for Christ, Youth for Christ and Singles for Christ, as God's gift for CFC to bring about conversion and renewal among the young generation. These Ministries are founded on four basic principles of Fun, Friendship, Faith and Freedom. Finally, they exhorted members to rededicated themselves to raising families in Christ and become true witnesses to the ends of the earth. Nonthaburi chapter completed a strategic CLP held in St. Christina Retreat House on 23-24 September and welcomed 18 new members (2 CFC, 1 SOLD, 6 HOLD and 7 SFC) at the dedication ceremony held a week after on 1 October 2017. Six more new members (1 CFC, 2 HOLD and 2 SFC) were expected to join later. The programme was facilitated by the chapter leaders Jojoy and Emelyn Mission together with Tony and Emily Dalisay (North Bangkok household leaders) and the rest of the members of the Nonthaburi chapter. North Bangkok chapter provided full support by sending speakers, music ministry and discussion leaders. The CLP also received generous support from the Our Lady of Mercy church through PIME priests Fr. Daniel, Fr Paolo and Fr Raju as well as from OFM priest Fr. Francis. CFC Family Ministry successfully concluded a youth camp held at the Don Bosco school in Pakkred on 30 September to 1 October 2017. Some 15 youths participated in the event. It was organized and facilitated by youth members led by Miguel Marqueses with support from YFC North Bangkok Couple Coordinators Vince and Karen Marqueses. The Women’s Conference “My Heart in Your Hands” was brought to the sisters and brothers in South Thailand and held at Dusit Thani Hotel, Laguna, Phuket on 27 August 2017. Some 30 participants from Phuket Laguna, Phuket Town and Krabi attended. Participants were mostly CFC wives, HOLD and SFC members. Two speakers from Manila, Sis Edythe Avendano, HOLD International Coordinator and Sis Nina Caunga, HOLD Sector Coordinator together with Sis Tess Montalbo facilitated the conference leading the participants to reflect on their coming and journey of faith, standing firm in the faith, resolving to be courageous and strong, and how to express acts of love. Sis Donna Campos, CFC-Phuket Coordinator with Sis Jhozine Damaso, CFC-HOLD Coordinator, led the organization of the conference with support from Bro Sonny and Sis Tess Montalbo. Other CFC Phuket members also provided active support in organizing and facilitating the successful event. CFC Central Bangkok chapter conducted a Christian Life Program at the Holy Redeemer Church in Bangkok for six Sundays starting from 6 August to 10 September 2017. A total of 32 new members graduated and welcomed (5 CFC couples, 12 SFCs, 8 HOLD, 2 SOLD) to the community at our Lord’s Day General Assembly on Sunday, 17 September 2017. The service team members were from the households of Patrick and Anne Lozare, Joseph and Christina Gonzales and Gary and Ana Hufana. 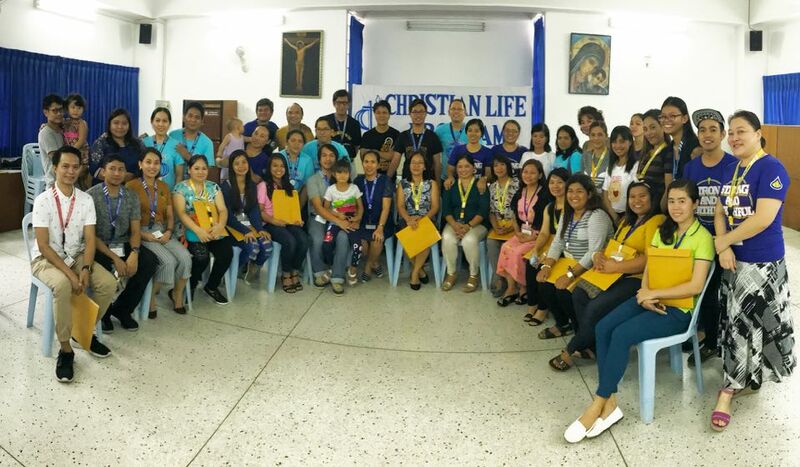 During the CLP graduation, the graduates witnessed how their lives were changed and how God used the speakers, sharers and their discussion groups to the renewal of the Christian life. This was indeed another successful harvest and opportunity for spiritual growth for the service team members as well. Some 100 women members from the Handmaid of the Lord (HOLD), Couples for Christ (CFC) and Singles for Christ (SFC) in Bangkok gathered at the Aimphan Education Center, Nonthaburi on 20 August 2017 to rediscover and grow in faith through the annual CFC Women Conference. Sis. Edythe Avendano, HOLD International Coordinator and Sis. 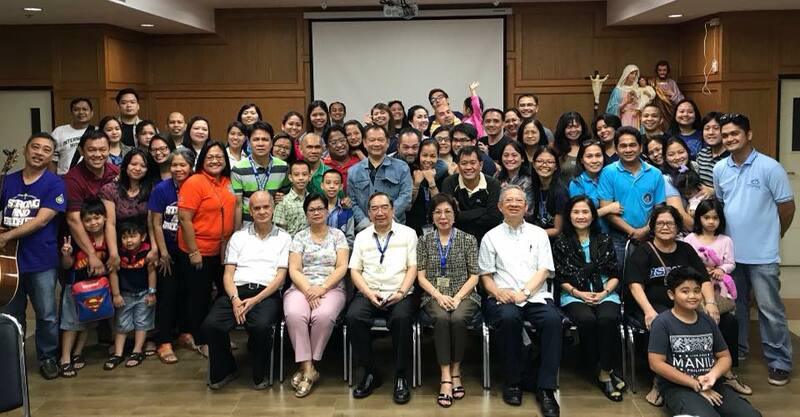 Nina Caunga HOLD Sector Coordination from Manila facilitated five sessions leading participants to reflect on their coming to and journey of faith, their struggles and challenges, standing firm in the firm, resolve to be courageous and strong and acts of love. Some local members enriched the reflection with the sharing of real life experiences. As in any other CFC events, the conference opened with the celebration of the Eurachist by Father Mauro from the Franciscan retreat center in Lamlukha. Sis Jhozine Damaso, CFC-HOLD Coordination, CFC Thailand led the organization with support from the Family Ministry Coordinators Sonny and Marites Montalbo. Other HOLD and CFC members also provided active support in organizing and facilitating the successful event. 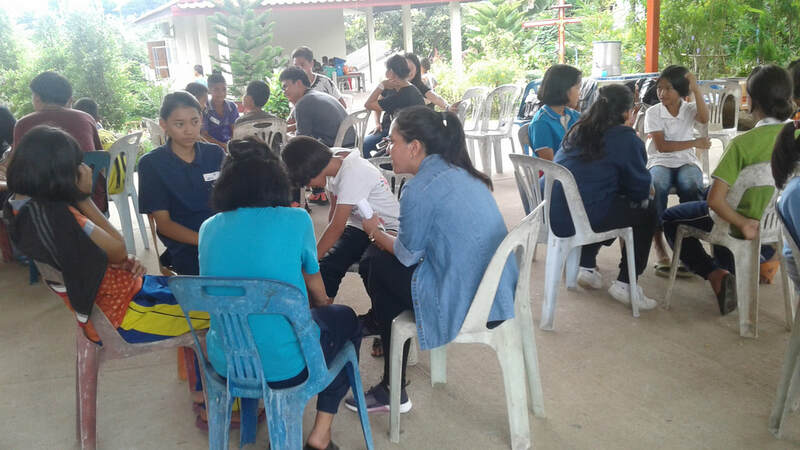 On 8 July 2017, the CFC/SFC/HOLD Chiang Mai organized an outreach activity in a Karen village in Mae Wang district with 40 Karen families under the Diocese of Chiang Mai and pastored by Fr. Vinai. The 13-member group traveled 2 hours from Chiang Mai in 3 vehicles through very rough and narrow forest road. The 3rd vehicle was not able to reach the village and got stuck along the road, needing some 10 people to dislodge it and return back to lowland. The group arrived at around 11.00am and met 20-30 children waiting. The SFCs organized fun games and then activities moved to a classroom because of rain. The rain dragged on to damp the place and made the return to Chiangmai difficult. Some village Karen mothers came and observed the activities. The group had lunch together with the some children’s mom. After lunch, they continued the activities in the classroom with games and dance presentation. They distributed goodies for children and gave donated things to the teachers. A used computer was donated and installed in the school. After taking group pictures with the children and villagers, the group started to return back to Chiangmai through another longer route but was immediately got stuck. The villagers came to help pull the vehicles out. With prayers and travel for 2 ½hours, they arrived Chiang Mai at 5:30pm. 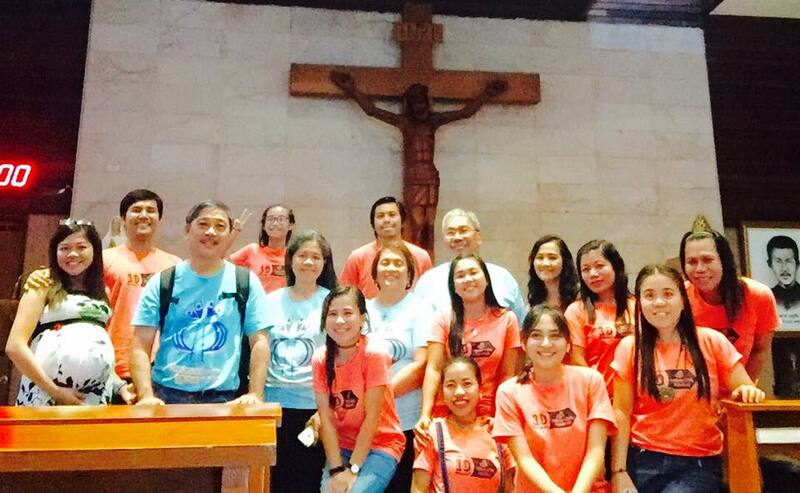 Yet again, another Conference for YFC was conducted in the Philippines. This time, it was held from 7 to 8 April 2017 in Laoag City, Ilocos Norte. The event was joined by more than 7,000-strong YFC members from all over the Philippines and around the world. In addition, the event was a momentous occasion as it was the first time that more than 200 foreign delegates joined the event. It was considered the largest, so far. Thailand was blessed to have the opportunity to join the said event this year. The YFC Thailand delegation consisted of 8 YFC members from North, Central, and South-East Bangkok chapters - escorted by their 4 couple-coordinators. The Mariano Marcos Stadium overflowed as the event filled the air with music and praising songs lead by the powerful worship leaders, Music Ministries (graced by the appearance of the LiveLoud band), and from the uplifting and inspiring testimonials from our fellow brothers and sisters from YFC, SFC, HOLD, SOLD, and CFC couples as they share their lives in the service for God. Some 120 Thai members of CFC Ubon Ratchatani gathered at the Fatima Church in Ubon on 13 May 2017 to celebrate 23 years of the local community. The event started with a community worship and a mini-talk from Ajarm Arom followed by the celebration of the Eucharist presided by Bishop Banchong together with 8 local priests. A 6-course Chinese laureat lunch and fellowship was organized in a nearby resort hotel for fund-raising to support CFC-Ubon activities. Six members from CFC Bangkok joined the celebration: Ajarm Arom, Prakan and Prasri Oudomugsorn, Jimmy Lozare, Sim Caluyong and EDante. After the celebration, the group visited the cemetery where late Fr. Bernard Guilleman was laid to rest. Fr. Guilleman, MEP, was the former spiritual director of CFC Ubon for ten years (1995-2004). They also visited the newly built Immaculate Conception Cathedral in Ubon before heading back to the airport to return to Bangkok. Click to view more photos of the celebration. CFC Vientiane launched the first weekend of two-weekend CLP programme on 6-7 May 2017 at the city's Catholic church compound. Both participants and members of the community listened to six CLP talks and testimonies. Edgar and Moonyeen joined the local service team to give the orientation, Who is Jesus Christ, Repentance and Faith and Loving thy neighbor talks. They traveled to Vientiane via Udon Thani and crossed the border by bus. Fr. John Tamayo, SDB, national spiritual director of CFC-Thailand, has been assigned to be new parish priest for St. Theresa Church in Hua Hin starting in May 2017, from being assistant pastor of St. Joseph Church in Ban Pong, Ratchaburi. He takes over from Fr. Dheparat Pitisant, SDB, who becomes Provincial Head of Salesians Thailand. Fr. Dheparat moves to the Salesian Mission House behind MHoC church in Krungthep Kreeta, off Srinakarind Road. It is expected that Fr. Tamayo will moved to Hua Hin next week on May 5th. Edgar, with support from Moonyeen, gave a talk on “Financial Stewardship” to the CFC-Nonthaburi Chapter during its regular weekly meeting on 2 April 2017 at the Our Lady of Mercy Church campus. Members of the chapter expressed their commitment to support the evangelization work of CFC-Thailand through their regular tithe contribution. Father Daniel participated in the meeting and provided further teaching on the subject matter. ​The conference called SFCs to be vigilant and watchful for anything, both from within and from outside, that could threaten their relationship with Jesus from flourishing. It reminded the delegates to deepen their “appreciation” (knowledge and understanding) of being Catholic and to exercise faithfulness in the ordinary, and emphasized the importance of having the light of Christ’s love in our life to illuminate the shadows still present in our lives. The conference concluded by encouraging and challenging the SFCs to respond to the call for purity which is much more than moral behavior. Purity is first and foremost a matter of the heart. To be pure is to be single-minded for the Lord. Every SFC is called to holiness and this calling involves honoring what is true, good and beautiful. About 100 CFC leaders in Bangkok and upcountry areas gathered at the AIT Centre on 25 November 2017 to reflect on the mission of CFC and plan for next year's activities. The reflection part was facilitated by the Manila team led by Bombee and Beth Tiongson, Country Coordinators for CFC Thailand. It focused on the structure of a CFC chapter, the roles and responsibilities of CFC leaders and the challenges faced by them in carrying out the mission. A time was spent by each chapter and ministry to identify activities and practices that need to be stopped and those that need to be further strengthened. The second part comprised a series of presentations from the national coordinator, mission worker, chapter heads and family ministry highlighting the key events of the year and the plan for next year. Sonny & Tess Montalbo with CFC/SFC/HOLD/SOLD Chiang Mai, Rowena, May, Angel and Lawrence, Lulu, and Bill conducted a strategic Christian Life Programme (CLP) at the farm orchard of Sis. Linda in Huisom, Sanpatong on 18 and 19 November 2017. The CLP started in the morning with the orientation with some dynamics between the talks, and ended late with Talk 9 and praying over. For the following day the remaining talks were continued after the Eucharistic celebration as everyone was serving the Sacred Heart Church as a choir. The CLP produced 6 graduates (4 SFCs and 2 HOLDs). Everyone was inspired and looking forward to join next year's activities. Family Ministry couple coordinators for YFC and KFC and SFC and HOLD volunteers from Central, North and West (Nonthaburi) Bangkok chapters conducted their first-ever Youth and Kids' Camps in Thai language for hill tribe children in Srivichien Village, Amphur Muang, Chiang Rai province, Diocese of Chiangmai, last Friday-Saturday, Oct. 13th-14th. Led by Sonny and Tess Montalbo, Family Ministries national couple coordinator and members of the Thai national governance team (national council) the Service Teams were warmly welcomed by Fr. Matthew Ekachai of the Camillian fathers, pastor of St. Camillus parish, and villagers, mainly from Akha and Tai Yai tribes from Myanmar, south China and Laos. Twenty children (8 boys and 12 girls) completed the YFC Camp with twelve children for the KFC Camp. 17 couples and more than 20 Handmaids, mainly from Akha tribe, attended the first Thai CLP in Srivichien Village, Amphur Muang, Chiang Rai province, Diocese of Chiangmai, last weekend, Oct. 14th-15th. The Bangkok Service Team was led by national council elders Amb. Precha and Khun Sirikul Pitisant, and assisted by Acharn Arom Poolpokpol, Bro. Prakal Oudougsorn and FTPW Jimmy Lozare. They completed Module I of Thai CLP, with Module II scheduled for Sunday, Nov. 22nd, and Module II for Dec. 10th. Fr. Ekachai requested that the CLP be given gradually for the teachings to "sink in". Most understand the Thai language, especially the Tai Yai tribe participants. CFC Laguna Phuket welcomed three new SFC members and one additional participant at the culmination of its home-based Christian Life Programme held at the residence of Ariel and Dhonna Campos in Cheong Thale on Sunday, 24 September. Edgar joined the session to welcome the new members and gave the final talk on Transformation in Christ. Members of CFC Laguna and CFC Phuket Town came to join the activity, which culminated with testimonies from both new and old members. New members testified that the sacrifices and love shared by members as well as the various CLP talks inspired and transform them. It was also a good opportunity to recall the first CLP in Phuket Laguna that was held in 2009 since some of the pioneers were present at the session. Old members encouraged newly graduates to be actively involved and support the activities of the community. The entire CFC North Bangkok chapter assembled at the Church of Our Lady Mother of God in Rangsit on Sunday, 3 September 2017 to welcome 23 new members (1 CFC couple, 16 SFCs, 2 HOLD, 3 SOLD) to the community at the Christian Life Programme (CLP) dedication ceremony. The service team composed members of the households of Francis/Espie, Vic/Em and Alvin/Kristine and conducted the CLP for 8 Sundays since 16 July. Jimmy Lozare, Fulltime Worker, gave the concluding talk on Transformation in Christ and prayed over the new graduates. Representatives from the graduating group gave powerful testimonies about their personal experiences leading to their attendance to the CLP and how the Lord has touched and called them to renew their faith and life Christians through the programme. CFC North Bangkok conducts annual CLP at the Church in Rangsit. CFC Thailand was exhorted to mature in the work of evangelization and become powerful witness of God's love by standing firm in the faith, being courageous and strong and acting everything out of love. This was the key message of this year's CFC theme conference held at Grand Lord Hotel in Srinakarin Road (http://www.grandlordhotel.com) on Saturday, 27 May 2017. Over 200 members of CFC Thailand listened and reflected on the five talks of the conference given by a mission team from CFC Manila comprising: Bombee/Beth Tiongson, Jun/Marla Rances, Junel/Cecile Ama, Farley/Ariola, Raymond/Arlene Azul and Norman/Gemma Robles. The conference was well attended by members from all chapters in Bangkok (North Bangkok, Central Bangkok, South and East Bangkok and Nonthaburi). A good number of participants came from communities in Phuket, Krabi and Korat. The event culminated with the Sacrament of the Eucharist celebrated by H.E. Bishop Silvio Siripong Charatsri, Prelate of Chantaburi Diocese and CBCT chairman for the Apostolate Commission for the Laity, Family and Youth. H.E. Bishop stayed on to join a special dinner hosted by the CFC Council together with the mission team from CFC Manila. The owner of Grand Lord Hotel, an active parishioner of Mary Help of Christian Church, Ms. Panadda Nilkumhaeng, participated in the mass and dinner. SFC members conducted its second medical mission of the year at the Thailand-Myanmar border in Ratchaburi on Saturday, 20 May 2017, together with Dr. Chat/Mary Anne from the Thai household and Edgar/Moonyeen from the Council. The mission team brought goodies for about 50 children and offered medical services to the sick. Children were also given ice cream whom they cherished with gusto. An SFC singing dou entertained the children with modern and Christian songs and led them to sing along with actions. The team from Bangkok arrived in the village at about 10:30 am and provided medical services until 1:30 pm to over 30 patients. Medicines and vitamins were also given free of charge. CFC has provided financial support to the mission to purchase the goodies and medical supplies. The SFC team has been conducting this mission in the border regularly once every three months for several years. There are over 20 villages occupied by Karen refugees who have benefited from this mission. Father Prasit, a Thai priest from Ratchaburi, has facilitated these missions and provided assistants to the team for translation and logistical support in travelling to the remote villages. He encouraged CFC to do more mission work as long as they are done with sincerity and love. Click to view more photos of the mission. Pats and Carla Gonzales from CFC North Bangkok volunteered to serve in CFC Laos on the 2nd week of their 2-weekend Strategic CLP on 13-14 May 2017. Pats gave CLP Talk No. 9 Receiving the power of the Holy Spirit on 13 May afternoon. Pray-over was done on the same day and the mini-talk on vocal praising was held thereafter. After the Sunday Mass on 14 May, Carla gave Talk No. 10 Growing in the Spirit. Four participants from Cameroon and the Philippines graduated on the same day. They were welcomed to the community after Talks 11 and 12 given by Bro. Manny Panagsagan, CFC Vientiane Country Coordinator. Pats and Carla praise God for the opportunity to be in Vientiane and serve CFC Laos again after many years! Members of CFC Laguna and Phuket Town assembled at the St Joseph Catholic Church in Cherntalay for its monthly general assembly on Sunday, 14 May 2017. The assembly was held following two English masses at St Joseph where CFC members and their families have been serving in the choir. The assembly began with an exhortation from Ariel Campos and followed with a community worship. Edgar from CFC Bangkok gave a talk on "How to get closer to God?" The talk emphasized that God wants intimacy with us and that our desire to seek and know God is a response to God's love. After the talk, some members gave a very inspiring sharing about the difficulties and challenges in living a Christian life and the call to be united with God. A Thai Team from CFC Bangkok composed of Ambassador Precha and Kung, Prakan and Praisri, Jimmy, Gail and Roel (SOLD-CB) met with members of CFC Hua hin community on 29-30 April. They also met with parish priest Fr. Dheparat who was scheduled to move to the Salesian Mission House on Krungthep Kreeta to take up his new position as Chapter Provincial (country head) of Salesians in Thailand. Fourteen CFC members and participants in previous activities plus four guests from the parish Legion of Mary group, attended the Thai General Assembly. Twelve members (2 couples, 8 SFCs) participated in the CLP Training held at the Sacred Heart Church in Vientiane, Lao PDR on 8 April 2017. The mission team from CFC Thailand were composed of Bro. Mac and Sis Gigi Velayo, CFC GMA Missions Coordinator and Sis. Marlou Badiola, SFC Unit Head (SFC NBKK). The activity was held from 12 noon and concluded by 6pm. A simple fellowship dinner was held at the residence of Sis. Nova Ramos where the mission team got a taste of excellent CFC Laos hospitality. The CLP is planned to be conducted in two weekends on 6-7 and 13-14 May 2017 respectively. The Community in Laos is counting on the support from CFC Thailand through a team of speakers and sharers for the CLP. Over 60 leaders of CFC Thailand gathered on 3-4 December 2016 at the Camillian Pastoral Care Center, Lat Krabang, Bangkok for their spiritual retreat and planning workshop. The annual event revitalized and united in mind and spirit the leaders to grow in their love and service for God. They went through a process of listening to the challenges and concerns of the members and discerning God's will for the community. Father Daniel Mazza, PIME led the group into a reflection of the challenges of family and community life and the teaching of the church based on Pope Francis exhortation's the Joy of Love in the Family. Members were urged to always start with love and live with love as the guide for all actions and service. The retreat discerned that the focus for the coming year is to further strengthen the spiritual formation of its members through formation programmes, upcountry and foreign mission work and charitable activities. The meeting was blessed by the presence of Bro. Bombee and Beth Tiongson, Country Coordinator for Thailand and leaders from Phuket and Krabi. ​Together with JESUS, Together we CAN! Bombee Tiongson, Manila-based CFC Thailand Country Coordinator, with his wife Beth, visited the CFC community in Chiang Mai on 11 September 2016. It was their first pastoral visit to the area. Bombee gave a talk on “Taming the Tongue”. They also attended the CFC Thailand Council Fraternal household meeting the following day after a 9-hr bus trip back to Bangkok. Their next pastoral visit is scheduled for 3-4 December 2016 to participate in the CFC Thailand Leaders' Retreat and Planning Workshop.